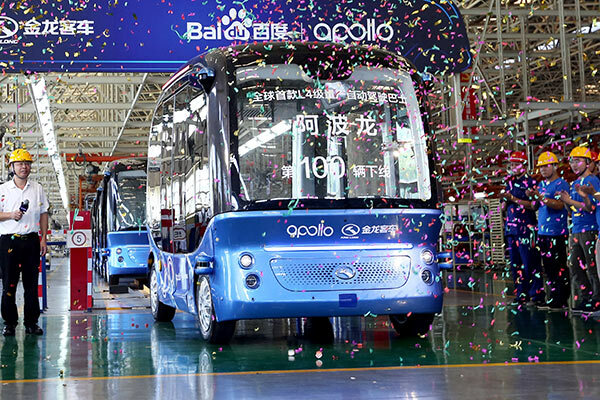 澳洲分分彩官方开奖 www.fvelz.cn Chinese tech giant Baidu announced that its newly developed self-driving bus would begin mass production as the 100th bus came off the production line Wednesday in southeast China's Fujian Province. The self-driving bus, named Apolong, was co-developed by Baidu and commercial vehicle manufacturer King Long. The bus, which lacks a steering wheel, driver's seat and brake, is instead equipped with a Baidu Apollo autonomous driving system, which is able to perceive its surroundings, predict the movements of vehicles and pedestrians, and plan optimized routes based on high-definition maps and intelligent sensing capability, according to Chen Weixiang, vice CTO of King Long. Trials of the bus have been carried out in Fujian and Chongqing Municipality. Initially, the bus will be used in semi-enclosed and enclosed areas, such as scenic areas, industrial parks and airports, with a limited speed between 20 and 40 km per hour. The buses will be put into demonstration operations in Beijing, Xiongan, Pingtan, Guangzhou, Shenzhen and other Chinese cities. They are also expected to be exported to Japan in the near future. Chinese tech giant Baidu announced that its newly developed self-driving bus would begin mass production as the 100th bus came off the production line Wednesday in southeast China's Fujian Province.